William Ellis Boyden was born in 1807. He ran the Plymouth/Sandwich Stage coach operation starting in 1822. After the Cape Cod Branch Railroad came to town in 1848, he formed the Cape Cod Express Company for handling, packing, picking up and delivering local freight and for moving the mail between post offices and trains. Boyden was a chief supporter of a Universalist religious society which built a church in 1845 on the corner of Main and Summer Streets. Membership soon declined and the church was closed in 1869. Boyden served as President of the new Sandwich Savings Bank which was founded in 1856 by glass factory owner Deming Jarves and other local merchants and landowners. In 1857 he established what became known as the “Boyden Block” on Main Street between the Unitarian Church and the Central House. It consisted of a long building of several shops and a large hall upstairs where the DeWitt Clinton Lodge of Masons met and the Charles Chipman Post #132 G. A. R. and Relief Corps and Sons of Veterans had its headquarters. He also built a large livery stable adjoining where he kept his old Plymouth stage coaches. The Boyden Block and Boyden’s homes were built by Gustavus Howland who also built the Boardwalk. He was the son of Ellis Howland who built Sandwich Town Hall in 1834. Boyden supported the Sandwich troops in the Civil War and gave a sword to Captain Charles Chipman of the Sandwich Guards. In 1884 he was instrumental in building a large Casino on School Street (now gone). William Ellis Boyden died in 1879. He had four children including Willard Ellis Boyden who inherited the property. Willard went bankrupt in 1900 and lost all of the property including the house and Boyden Block. In December, 1913 the Boyden Block was destroyed by fire. 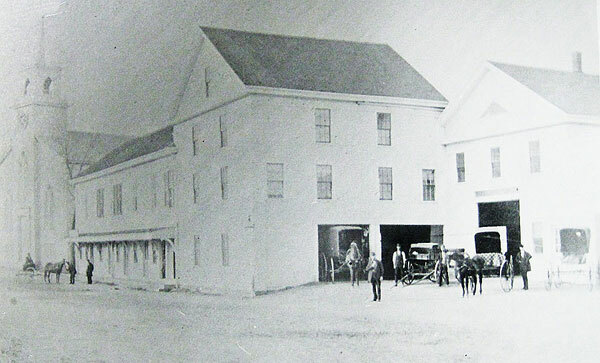 According to an article in the Barnstable Patriot, at the time of the fire the Block was home to S. R. Bourne’s paint shop, Philip Govoni’s fruit store, furniture upholsterer E. H. Woodward, a hat store, a variety store owned by Mrs. A. W. Parks and Mrs. Frank Galdro, and electrical contractors named Garland and Bartley. All eighteen horses from the livery stable (owned at the time by J. R. Holway) were rescued but most of the beautiful Plymouth stages were lost. 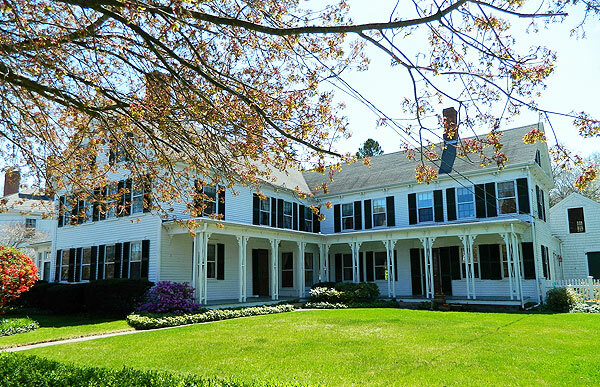 The W. E. Boyden House, a large 2½ story 2-family home built with both Greek Revival and Italianate features was built circa 1842. It still stands at 148-150 Main Street and is in beautiful condition. The left side of the house was occupied by Nathaniel Howard who was in a limited partnership with William Boyden. Howard ran the stage service between Hyannis and Sandwich. Boyden basically operated between Sandwich and Plymouth. We have learned from the current owner that the original house had 5 rooms on each side for a total of 10 rooms. The left side was rented and the materials in it were of average quality. However the right side was occupied by Boyden and he used expensive materials, e.g. marble fire places rather than brick. Mr. Boyden added the ell on the right side around 1846. It measures 36×15 and was incorporated into the double house. This greatly enhanced his side of the house to 10 rooms. It is believed the original structure was done in federal style, but the gable end faces the street to accommodate the double house. Sometime during the Victorian period the porch was added along with the distinctive column bracing. Boyden also owned a farm located off today’s Route 130/Cotuit Road and running down to the shore of Peter’s Pond. Agricultural activities ceased in 1932. In 1986 the parcel was purchased by the town with the invaluable assistance of John A. Ohman, other local conservationists and funds from the state Self Help Fund. Known as the Boyden Farm Conservation Lands, this area is now preserved by the Sandwich Conservation Commission. 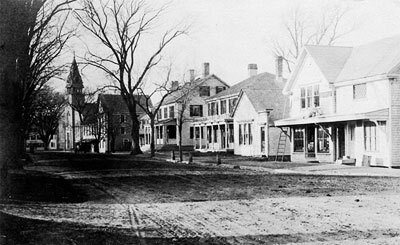 “In 1822, when a line of stages between Plymouth and Sandwich was established, Mr. Boyden moved to Sandwich. He was an active, persevering young man, making daily trips from Sandwich to Plymouth and return. This he did as proprietor, for a period of twenty-six consecutive years without a week day that he was not engaged on the route. The present Central Hotel, of Sandwich, was the Cape terminus of the line, and from there started the Falmouth, Yarmouth and south-side stages, in which Mr. Boyden was more or less interested. He drove four horses, to one of those old-fashioned coaches, and it was a characteristic of his to be on his schedule time if human device or energy could prevail. Once on his way to Plymouth he was snow-bound at Cook’s hill and could proceed no further with his coach, but with his usual zeal he provided for his passengers, tied the mails to his horses’ backs, placed the four horses in a single line and forced his way. This particular coach remained under the snow ten days. Mr. Boyden was necessary to the success of this line, and for the period ending with the advent of the railroad was a strong factor in the welfare and development of the Cape. It is said that on the day preceding a Thanksgiving, he brought in thirteen coaches filled with passengers. He was identified with every improvement of his town, and was actively engaged in public affairs. His political views, always democratic, were marked by a firmness which was known and respected. DeGraw, Andrew, Jr., dedication brochure for Boyden Farms Conservation Land, Apr. 23, 1994. 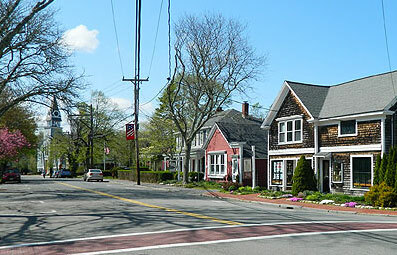 Town of Sandwich Archives and Historical Center: Historic Resource Survey Files, SHC Asset Files. This entry was posted in Architecture, Churches, Historic Buildings. Bookmark the permalink.